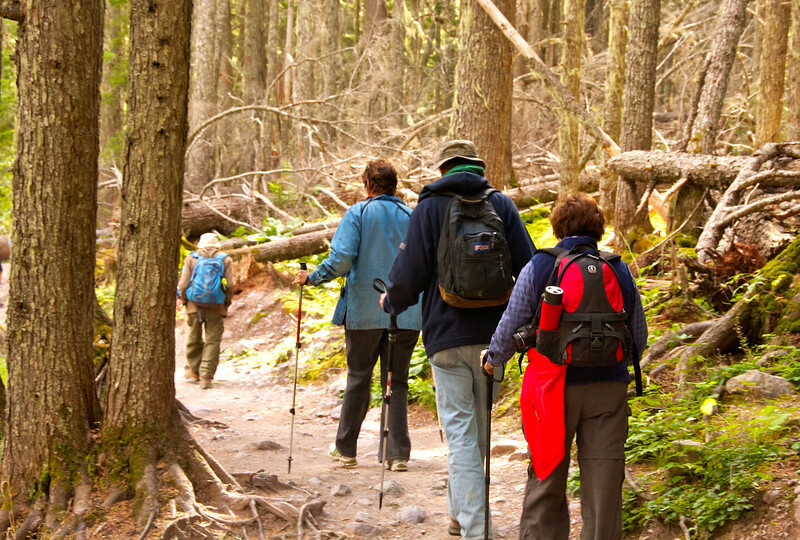 Are you looking for a moderately easy hike in Glacier National Park? Not all boomer travelers are ready for a vigorous backcountry experience in Montana’s wilderness. 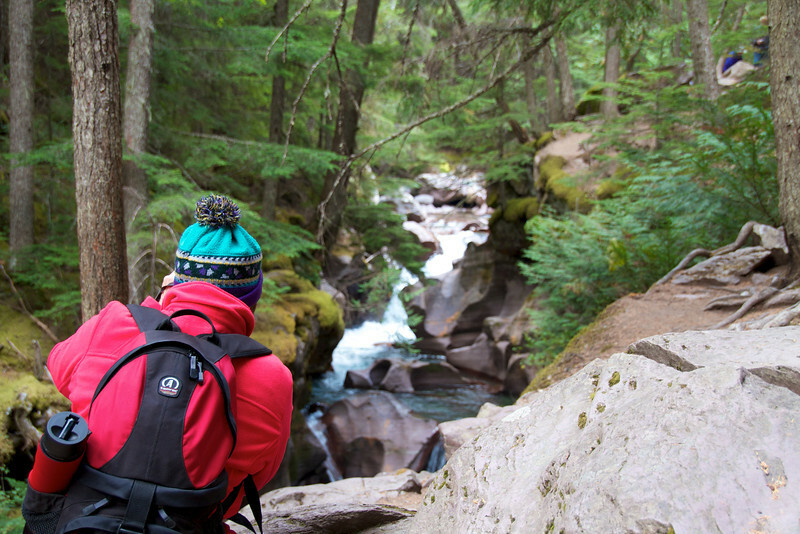 If “moderately easy” is more your style, Avalanche Lake Trail is for you. As soon as your vehicle passes through the west entrance of the park, head straight for the parking lot at Trail of the Cedars loop trail, about 5.5 miles east of Lake McDonald Lodge. About halfway along the wheelchair accessible path, you’ll arrive at the trailhead for Avalanche Lake Trail. Alan and I hiked here on a nippy September morning when we participated in a Glacier National Park hiking program with Road Scholar. Although the trail begins with a short but steep uphill climb, the approximately 4-mile-round-trip-hike only gains 500 ft. over moderately rolling terrain. 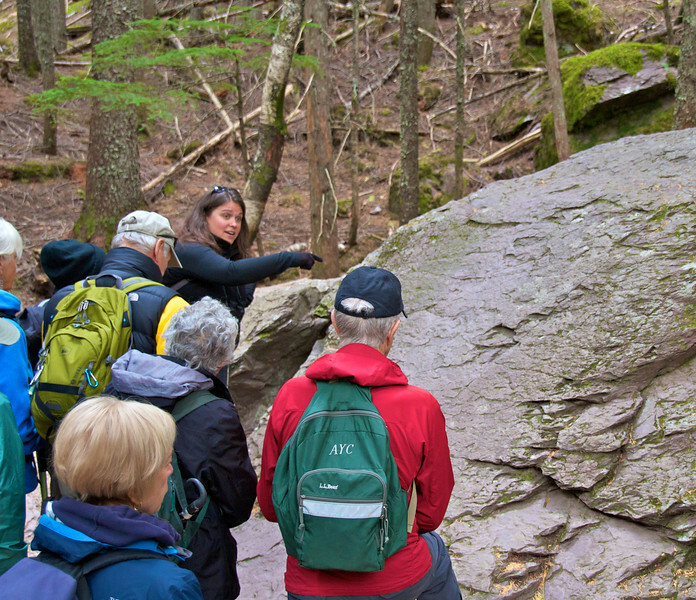 The journey takes hikers through an old growth cedar and hemlock forest to the glacier-fed Avalanche Lake. Don’t spend all your time taking photos of Avalanche Creek. There’s hiking to do! It’s tempting to spend way too much time photographing Avalanche Creek as the trail skirts Avalanche Gorge towards the beginning of the trail. 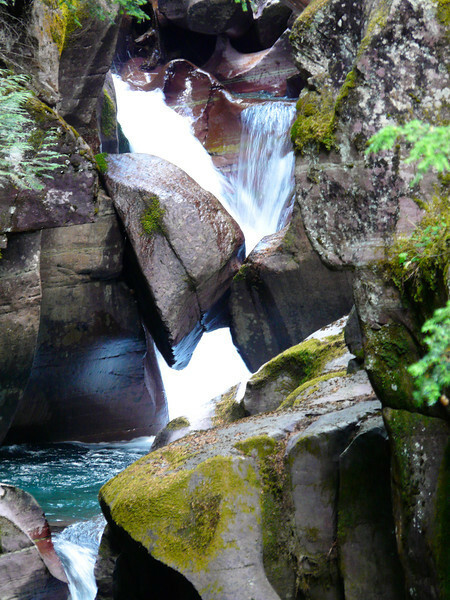 After all, who can resist capturing the scene of rushing water colored by glacial silt as it twists and turns around boulders on a path through the narrow channel. Continuing on, the trail leaves the creek bank behind to travel through a dense forest of old growth cedar trees and hemlocks. Although the creek isn’t in view, the sound of gurgling water rushing through the creek is loud enough to be heard most of the way to Avalanche Lake. “You’re standing on the eastern edge of the Pacific Northwest’s temperate rainforest,” Road Scholar guide, Stephanie Paidus, told us as we stopped for one of her frequent lectures on the flora and fauna in Glacier National Park. Learning about what we were hiking through was one of the benefits of traveling on a group hiking program. As the hikers became spaced out, the forest grew quiet except for the twitter of birds and the rushing of the creek. 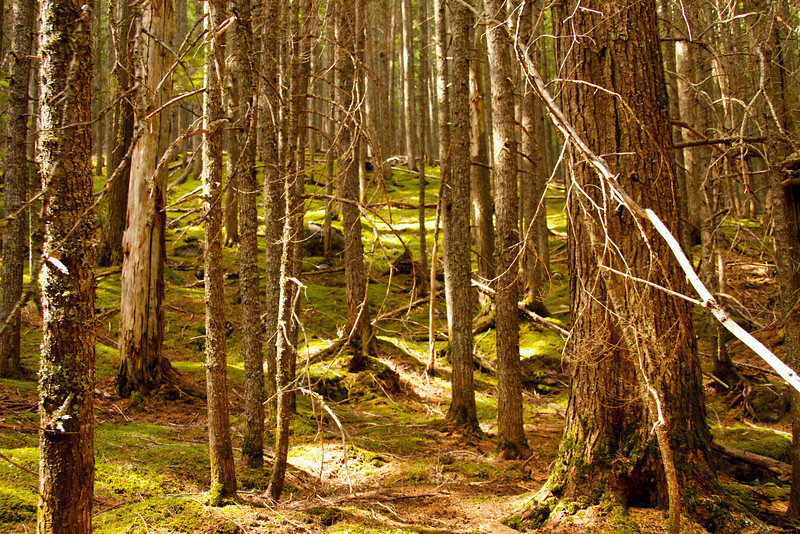 Sunlight filtered through the thick branches of the cedar grove casting dapples of brightness on the moss-covered ground that looked like a bolt of plush, green velvet cloth had been spread out underneath the trees. It was tempting to sit in this soft, gentle spot for a time to take in what surely must be nature’s cathedral. About 1.6 miles into the hike, we discovered another example of natuer’s power. Downed trees littered the ground from an avalanche that thundered down Mt. Cannon in 2010 and a micro burst that downed more trees in 2011. While it’s distressing to see so many fallen trees, it did open up a mountain view of Logan’s Pass that wasn’t previously visible. Reaching Avalanche Lake, Alan and I chose a seat on one of the large logs that were scattered on the beach. We pulled sack lunches (provided by Road Scholar) out of our backpacks as a gusty wind pushed clouds across the sky. Munching on sandwiches while watching thin ribbons of waterfalls stream down rocky mountainsides into a lake that shimmerd in the sun was a scenic way to picnic. On the return trip, our group of hikers progressed each at his or her own pace, meaning that Alan and I stepped it up a bit to stretch our legs on this well-traveled trail. The forest was just as beautiful on the way back and it gave us extra time to photograph Avalanche Creek. This is a very popular Glacier National Park hiking trail. To avoid the crowds and be assured of a parking space, hike early or late in the day, especially during the summer. Have you hiked Avalanche Lake Trail? Join the conversation at the My Itchy Travel Feet page on Facebook or send us an email to ask a question or share your experience. 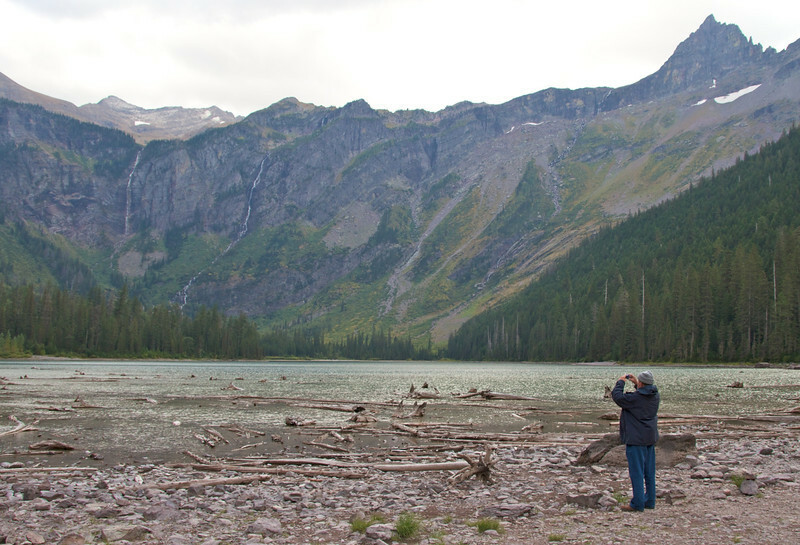 Looking for Glacier National Park hiking advice? 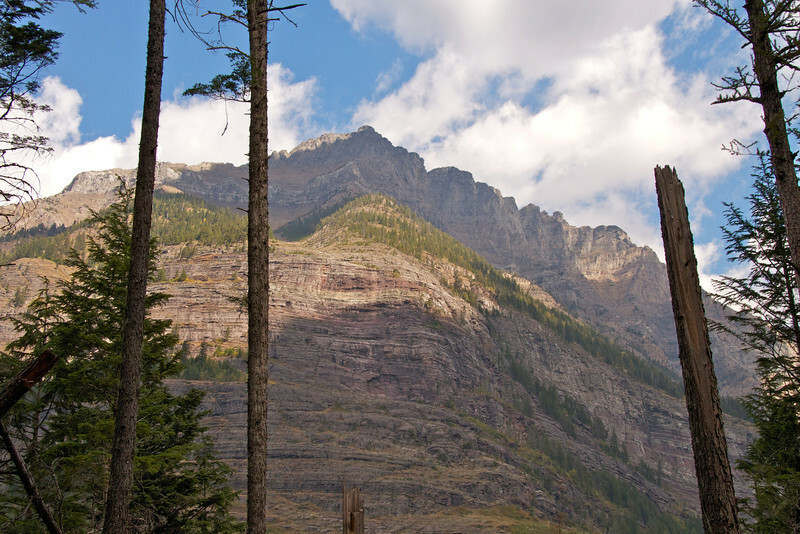 Discover our favorites by clicking on: Glacier National Park Hikes.